Tonight, there will be a debate in Erlangen about the recent education protests that took place in Germany and Europe, to which I’m invited as a guest speaker. The discussion will cover the analysis, criticism and perspective of the protests, what difference the protests made and if / how we can achieve a just, democratic and emancipatory education system. 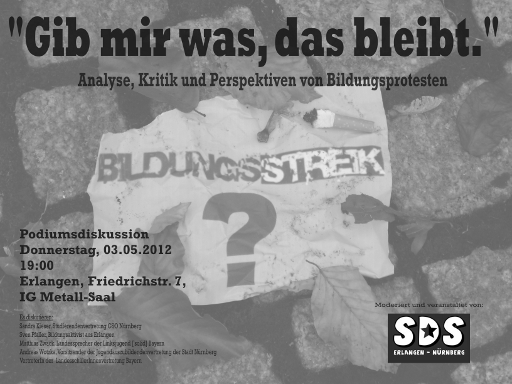 This entry was posted in Activism, en and tagged analysis, criticism, debate, education, erlangen, guest, perspective, protest, speaker on May 3, 2012 by Noya. On December 10th, people all over the world again will take to the streets. They will raise their voice and take action for global change – and human rights. Echte Demokratie jetzt! Erlangen // Occupy Erlangen [Real Democracy Now!] joins the movement on this global day of action with a visual public discussion. 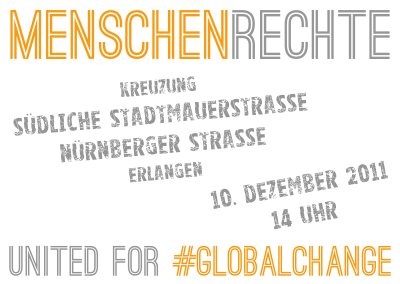 This entry was posted in en, Occupy Erlangen and tagged #10dec, #globalchange, erlangen, human rights, occupy, real democracy now on December 9, 2011 by Noya. Today, on the 15th October, people in hundreds of cities all over the world will take to the streets for real democracy and global change. 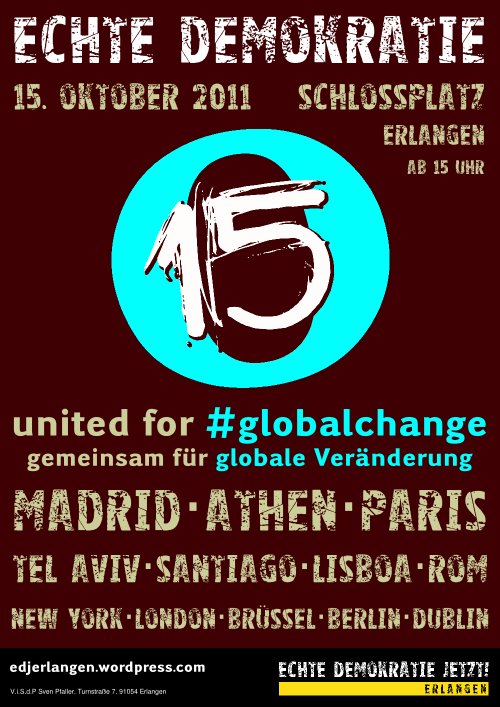 This entry was posted in en, Occupy Erlangen and tagged #15o, #globalchange, assembly, erlangen, occupy, real democracy now on October 15, 2011 by Noya.